The temple is situated in the village Panataran, Nglegok, Blitar district, East Java, Indonesia. Its location is situated at the foot of Mount Kelud, making the air cool Panataran Temple area. The temple complex enshrinement Panataran is the largest and most well maintained in the province of East Java, Indonesia. The temple is a temple Panataran rich with various shades of reliefs, statues, and the structure of Hindu-style buildings. The existence of sculptures Kala (huge grin), statues Ganesya (the god of science in Hindu mythology), statues Dwarapala (giant statues guard the gate), and also relief of Ramayana is an indisputable proof that the Temple is a Hindu temple Panataran. Palah inscriptions found in the temple Panataran area preach that this temple was built around the year 1194, during the reign of the king who ruled the kingdom of Kadiri Syrenggra, and completed in the kingdom of Majapahit. Thus this temple through the three kingdoms of the archipelago of Kadiri, Singasari, and Majapahit. 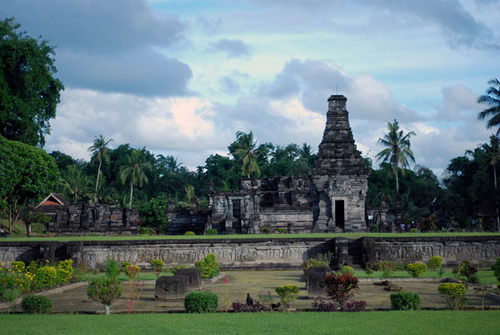 Panataran Temple plays quite important for these kingdoms, namely as a place of appointment of the king and place for the ritual worship of the Creator. Various studies by historians of ancient texts, the book written Negarakertagama Mpu Prapanca, for example, explained that the Temple Panataran highly respected by kings and officials of the kingdom in East Java. Temple Panataran never store ashes of the King Rajasa (Ken Arok) Singasari royal founder, and also the ashes of the King Kertarajasa Jayawardhana (Raden Wijaya) founder of the Majapahit empire. Even supposedly, according to local folk legends, sacred oath Gajah Mada Mahapatih to unite the whole archipelago in the power of Majapahit, known by the name "Sumpah Palapa", spoken in the Temple Panataran.